This summer seem to be filled with comic heroes movies and Green Lantern is one of them going up against Thor and X-Men. I was surprised with all the negative reviews from the critics. The movie was actually not too bad. Although it wasn’t the best of the three but it also wasn’t the worst of the three. I just realized that Green Lantern is the only super heroes who does not hide behind his super hero identity. His friend, Thomas Kalmaku (Taika Waititi) known Hal’s secret identity when Green Lantern saved the crashing party by manifesting race car and the raceway carrying the destroyed helicopter. “Doesn’t super hero always get the girl?” and Green Lantern tried to seduce Carol Ferris (Blake Lively) with his super hero identity but the bubble was immediately popped by Carol who known Hal since she was a kid. With the power to create anything, the CGI team has limited creativity. 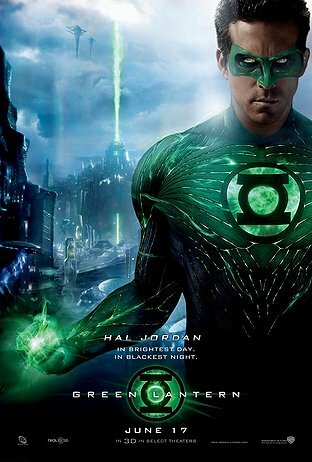 All the things Green Lantern created have been used before in other movies. I haven’t read the comic book before but I find it amusing that Hal needs to recharge the ring’s power with the actual lantern. Ryan Reynolds is charming with playful personality as usual. Peter Sarsgaard played a sympathetic evil villain infested with alien life form.